Communications Studies major Lauren Rogers will graduate in June 2015. 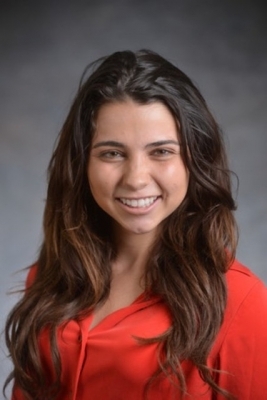 After summer travel in Europe, she will begin work in August as a Human Capital Analyst for Deloitte Consulting. 1. When did you first know you wanted to major in your field? Coming to UCLA, I didn’t know what I wanted to major in. As a freshman, I began taking communications classes and the value I found in them was remarkable. The classes aligned with my interests and goals for the future in an engaging way. 2. How would you describe your fellow Communications Studies majors? What kind of people are they? Communications Studies majors are outgoing, amiable and dedicated. Though the major is small in size, the multitude of interests and career paths people are pursuing helps me learn more than just the content of a class. 3. What professor in your field do you admire most and why? One of the professors I’m most grateful for is Professor Kochain, who taught Communications 1 – Oral Communication. He encouraged creativity and took the time to get to know his students. Public speaking is said to be one of Americans’ top fears, but after taking his class I felt really confident about speaking in public. 4. Can you remember a moment in class, a talk with a professor, or a reading that got you really excited? My favorite class at UCLA was Communications 128 on Play and Entertainment. We had an assignment in which we kept dream diaries of the narratives, thoughts, images and sensations that we recalled from a night’s sleep. In class we got to discuss the function of our dreams in learning, memory and overall wellness. This was an exciting assignment because I got to analyze something I do every day—dream—in a way that I had never done before. It also made me very appreciative of sleep! 5. What’s the most demanding or most difficult experience you’ve had majoring in your field? One of the most challenging aspects of the communications major is the level of creativity required. Many of our assignments are open-ended and require synthesis of ideas. 6. What are the most important skills you’re developing? The most important skills I’ve learned are perspective-taking and listening. Truly being able to walk in another’s shoes enhances any type of message and lets the words make more of an impact. 7. What will you gain by majoring in your field? How will it help you reach your goals? After graduation, I will begin my career at Deloitte Consulting. My job will be to help clients through strategic change. In order to implement change, communications that are both creative and comprehensive are essential. I’ve learned not only how to strategically formulate a message, but I have gained insight into selecting effective mediums for delivering messages. These skills will help me advise clients on their goals. 8. What other fields does the study of your field help you understand? As a double major in Psychology and Communication Studies, I have gotten first-hand exposure to the interdisciplinary nature of the Communication Studies major. Communications Studies and Psychology together have helped me understand how we cognitively process information as legitimate or not. This understanding will help me make decisions on how best to formulate messages for organizations. 9. What is the biggest misconception about your major field? Unfortunately, one of the common misconceptions is that the Communication Studies major leaves very limited possibilities after graduation. Contrary to that perception, it opens a number of doors – from Entertainment to Business to Law. The possibilities are endless. 10. How do you explain to family or friends why you’re majoring in your field? What do you tell them? At UCLA, we’re taught by leading communication researchers and faculty about the histories and ideologies that dominate the field. This knowledge is important for the internet-centric age in which we live. Knowing how to craft and create effective messages is very helpful in today’s global society.